Ben and Kathryn Stewart of Silver Bonsai Gallery, create heirloom quality jewelry through their mastery of jewelry design and technique. Greatest influences lie in Art Nouveau design, Japanese Woodblock Printmaking, and Italian Engraving. Applying many techniques found in turn-of-the-century jewelry intertwined with her use of modern technology, Kathryn and Ben create jewelry which reflects the qualities of each person she encounters. 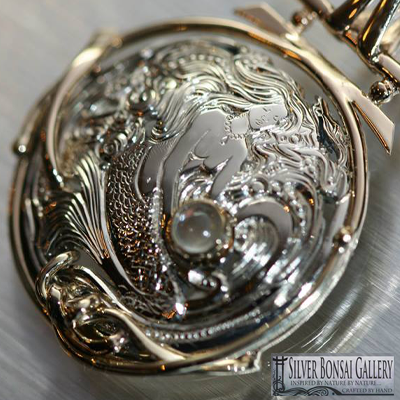 Silver Bonsai is the joint creation of Kathryn & Ben Stewart, who can now regularly be found at their jewelers benches located at the back of the gallery where they spend their time creating custom jewelry in gold, silver, or platinum. In 1998 they settled in Outer Banks of NC where they began renovating the building which is now home of the Silver Bonsai Gallery. The gallery is a reflection of the couple’s unique sense of style in art & design. Not only does the gallery house their uniquely handcrafted Jewelry, but is also home to a wide variety of local and regional arts & crafts, and an impressive collection of Bonsai trees and supply. Be sure to stop in, wonder through the Bonsai Garden, Enjoy artwork and functional pieces in a wide variety of media, Let Kathryn & Ben Stewart help find that special piece of Jewelry or find a unique treasure for yourself or a friend.